Just outside the small, charming lakeside town of Borensberg, where the beautiful plains of Östergötland meet the Göta Canal, lies Brunneby Musteri. In 1941, farmer Carl-Gösta Kjellin began pressing apples at his farm, Brunneby Gård. In doing this, he founded the family business Brunneby Musteri, now run by the next generation, Gunnar Kjellin and Eva Ronström. 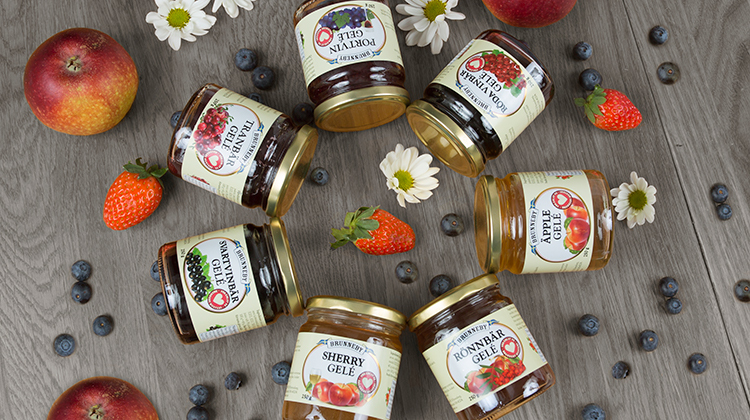 To date, we have been making fruit and berry products for more than 70 years. In autumn, we press amazing amounts of apples and in summer we press strawberries, blackcurrants and raspberries amongst other things. Our motto is natural, nutritious and delicious. We love artisanal food and true classics, however, we are always hard at work designing new exciting and flavourful products. Our inviting farm shop offers Brunneby’s own assortment of ciders, cordials, juices, jams and marmalades. We have more than 100 products of our own to choose from. We also offer a wide selection of other locally produced delicacies. In addition, we sell highly popular gift baskets. Every year various events are held at Brunneby, such as flea markets, a gardening expo and a Christmas market. You can also bring your own produce to us for processing. In summer we process rhubarb and blackcurrants and in autumn we process apples. The farm restaurant offers an alluring lunch menu and freshly made pastries for your Swedish fika. There is also a nice gift and interior design shop, full of beautiful items and local craftsmanship. GPS coordinates: 58.541476 N, 15.329332 E.
Saturday 10 AM – 4 PM.